NEW DELHI (Reuters) – A powerful leader of India‘s low-caste community on Tuesday told a court that setting up dozens of statues of herself reflected the will of the people to honour her and others at the bottom of the rigid Hindu caste hierarchy. 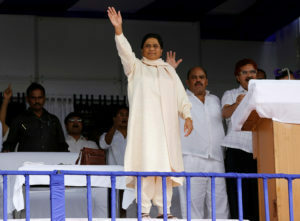 Mayawati, an icon of the Dalits and a four-time chief minister of the most populous state of Uttar Pradesh, has been an aggressive campaigner for the rights of the oppressed, vowing to shake the stranglehold of India‘s upper castes on politics. As leader of the state, she spent millions of dollars on memorial parks featuring life-sized marble and sandstone statues of elephants, her party symbol, Dalit icons and herself, evoking figures from history who built monuments as their legacies. Mayawati, who ended her last term in office in 2012 but is bidding to play a key national role in general elections this month, said the statues were built with the support of lawmakers who wanted to respect a low-caste woman leader. “Certainly I could not go contrary to the wishes of the state legislators,” she said in a signed statement to a court that is weighing a request from her critics for permission to demolish the statues as a waste of public funds. Mayawati leads the Bahujan Samaj Party that has forged an alliance with a regional group to pose a challenge to Prime Minister Narendra Modi’s ruling Hindu nationalist party in general elections that start on April 11. She called the case against her politically motivated and “gross abuse” of the court process, and asked why other parties’ expenditure of public funds for similar causes had not prompted questions from her critics. She cited the example of a $400-million statue of independence hero Vallabhbhai Patel that Modi inaugurated last year and which is nearly twice the height of New York’s Statue of Liberty. When she governed Uttar Pradesh, Mayawati blanketed hundreds of acres of prime real estate in Lucknow, the state capital, and elsewhere in pink marble and sandstone monuments. The memorials are a major tourist attraction in Lucknow and entry tickets generate huge daily revenue for the state, she added in her statement. Previous articleA drama student got ‘into his character.’ Then, he stabbed two people, police say.